In April 2017, Legacy Good Samaritan Medical Center in Portland started to offer non-invasive HIFU for localized prostate cancer. Legacy Good Samaritan Medical Center first opened its doors in 1875 to the Portland community. 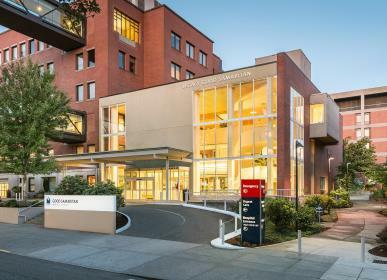 Since then, Legacy Good Samaritan has become the flagship hospital for the nationally-awarded Legacy Cancer Institute. Legacy Health is the only locally owned health care system, serving the greater metropolitan area of Portland, Vancouver and mid-Willamette Valley with six hospitals. Situated in northwest Portland, Legacy Good Samaritan is a dedicated community partner to its neighborhood for the past 140 years. Ranked among the nation’s best cancer programs, according to the American College of Surgeons Commission on Cancer, Legacy Good “Sam” is the center of prostate, breast, lung, colorectal, and other types of cancer surgery. Legacy is internationally known for its Bloodless Surgery and Medicine Program, which is headquartered at Legacy Good Samaritan. Legacy is the oldest and most experienced hospital to provide bloodless surgery. Legacy also has a highly regarded kidney transplant program. For outpatient procedures at Legacy Good Samaritan Medical Center, you get the convenience of your pre- and post-op stay in our Short Stay Unit with the security of your surgery being done in our main operating rooms with an entire hospital team there to support you through your procedures – anesthesiologists, OR technicians, nurses and physicians. All HIFU procedures are scheduled consecutively during the day so equipment and specialized staff are focused exclusively for HIFU procedures, increasing quality and consistency. Legacy Good Samaritan, situated in one of the more cosmopolitan areas of the city, is known for their attentive staff providing a home-like environment for patients. Interested in HIFU at Legacy Good Samaritan? Learn more about Dr. Stanley Myers here or find out more information about the hospital facility at their website: www.legacyhealth.org/goodsam.